A must do if you stay at Medellín! Guatapé is a small town a 2 hours bus drive away from the trendy and famous city Medellin. It is a perfect one day trip but also a place to stay more than one day! At the Bus Terminal Norte head down to the ground floor and buy your ticket at the ticket booth 14. It will cost you 14 COP like 4.50$ dollars one way! Guatapé is a really small town, the houses are coloured, in the centre are a lot of restaurants and the people are relaxed. There is a church and little stores to buy souvenirs. I think from there are also activities like a boat tour etc. At the same place the bus dropped you of, you can directly by a ticket to head back to Medellin! If you just want to go to the next attraction you can pay 2 COP for the bus or take a tuktuk motorcycle which drives you to the Rock of Guatapé. 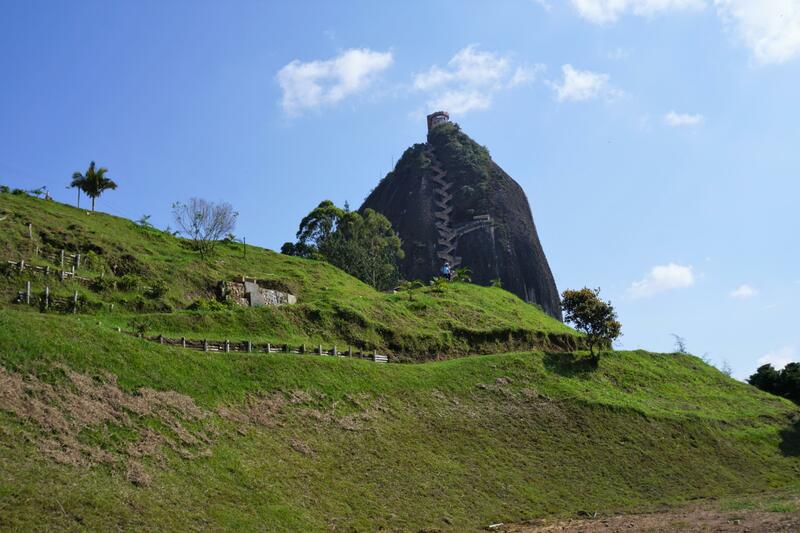 The most important attraction in Guatape is the huge stone … You need to climb up 700 steps till you on the top. I did it without stopping but it was hard. From the gas station you can walk up to the entrance and buy a ticket to go up the stone. Once you arrive at the top you will be speechless! The 360 degrees view is amazing. The indigenous Tahami, former inhabitants of this region, worshiped the rock and called it mojarrá which means rock! In July 1954, the stone was first climbed from Luis Villegas, Pedro Nel Ramirez and Ramón Díaz, with sticks fixed against the walls within 5 days. I stayed for two days in Guatape and slept in a really nice hostel Galeria Guatape Hostel in walking distance to the stone. The host of this hostel and all the people that work there are amazing. You can swim, enjoy a nice view over the lake and enjoy a free Coffee (the best coffee I had in Colombia) whenever you want. The breakfast was just delicious and also included in the price, a restaurant to eat dinner is close by! Thanks for reading my post, if you have questions about Guatapé or even Medellín just let me know.